Looking for the perfect baby gift all wrapped and ready to go? Look no further - we have done all the hard work for you! 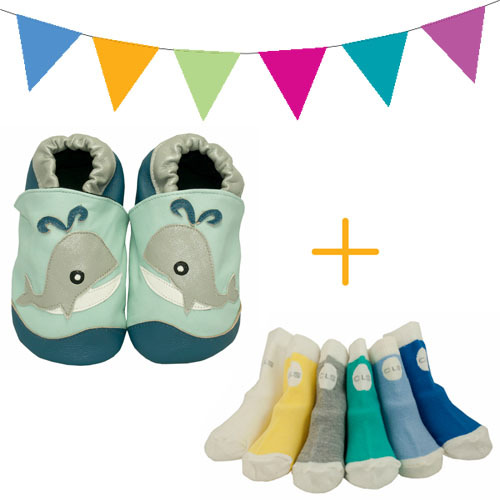 This baby gift pack includes 1 x pair of small Moby soft soled leather Cheeky Little Soles baby shoes and a box of 6 boys cheeky socks as pictured. * Cotton lined super soft leather, safe for toe suckers. * No uncomfortable open seams to rub on tiny feet. * Black padded soles for extra comfort and protection. * Skid resistant non slip soft soles. * Easily slip on and stay on. * Hand washable and easy to keep clean. * Come packaged in a recyclable cheeky clear shoe box. * 6 pairs/colours per box. * Socks are made from 65% cotton, 32% polyester and 3% spandex. * Come packaged in a recyclable Cheeky Little sock box. This pack will be gift wrapped for you and we can also include a personalised message, just don't forget to include your message in the notes section through checkout!